Deadly bird flu probably will arrive in the United States this year, and the government says it expects 20 to 100 suspected cases to undergo testing by the end of December. People are not yet at risk, officials said. The government has a plan to quarantine and destroy any poultry flocks in which the virus is found. "At this point, if you're a bird, it's a pandemic. If you're a human, it's not a pandemic," said Health and Human Services Secretary Mike Leavitt. Interior Secretary Gale Norton said: "This is a disease of birds and not humans at this point. Finding a bird with the disease does not signal a pandemic." Wild birds are getting much of the government's attention. Their natural migration is a potential pathway for the deadly strain, which has spread through Asia into Europe and Africa. Officials worry the virus might spread from migratory wild birds to the nearly 10 billion chickens raised each year in the United States. The deadly bird flu virus is rare in people, but scientists fear it could mutate into a form that could spread rapidly among people and possibly spark a worldwide epidemic. Authorities say cooking kills the virus, and it is safe to eat properly handled and cooked poultry. The government completed its plan on Monday to test 75,000 to 100,000 wild birds this year, an amount close to six times the number of birds screened since 1998. Once a test indicates the deadly virus is present, officials will announce a suspected case, Norton said. She said that could happen 20 to 100 times this year, and dozens of those announcements could be false alarms. After an initial screening comes back positive, it will take another five to 10 days for the Agriculture Department's laboratory in Ames, Iowa, to confirm the results. The emphasis will be on Alaska and the states and islands along the Pacific flyway, a common route for migratory birds into the United States, officials said. Tests also will be run on 50,000 samples of water or bird droppings from waterfowl habitats, the government said. The government also has a plan for commercial poultry, an industry in which companies have been testing every flock for bird flu. If the deadly virus should appear in one of these birds, the flock would be quarantined, the birds killed and the area disinfected. Agriculture Secretary Mike Johanns said the government would compensate farmers for destroyed flocks. Unlike many of the countries with bird flu, the United States has a highly consolidated, $29 billion poultry industry that raises most of its birds in controlled, indoor facilities. "Our producers are as eager as we are to protect the safety of our poultry," Johanns said. While the deadly Asian strain has not yet been found in the United States, other strains have. Birds have a flu season similar to the human flu season, and less virulent "low-pathogenic" flu viruses are common. On three occasions, 1924, 1983 and 2004, a lethal, "highly pathogenic" strain has emerged in the United States. Also Monday, the government banned veterinarians from using human antiviral drugs, such as Tamiflu, to treat animals. The goal is to make sure the drugs remain effective in people. 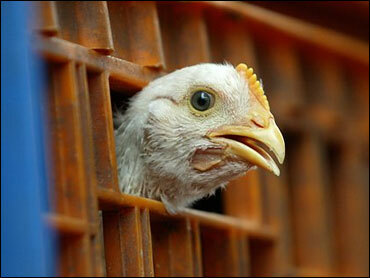 A spokesman for the National Chicken Council said the industry does not use the drugs.